Every so often I buy some tea from Taobao. Sometimes it’s a cake I already know and like and am just stocking up a little more. More often it’s something random – given that there’s MiniN and MicroN in the picture, my days of roaming the tea market for days on end is more or less over (at least for now). So, instead, I get to virtually shop online through the wonder that is Taobao, where Jack Ma claims the fake goods are better than the real deal. The smell though put me off. When I smelled the tea after it arrived it smelled like cooked puerh, which is odd, since this is supposed to be a raw tea. 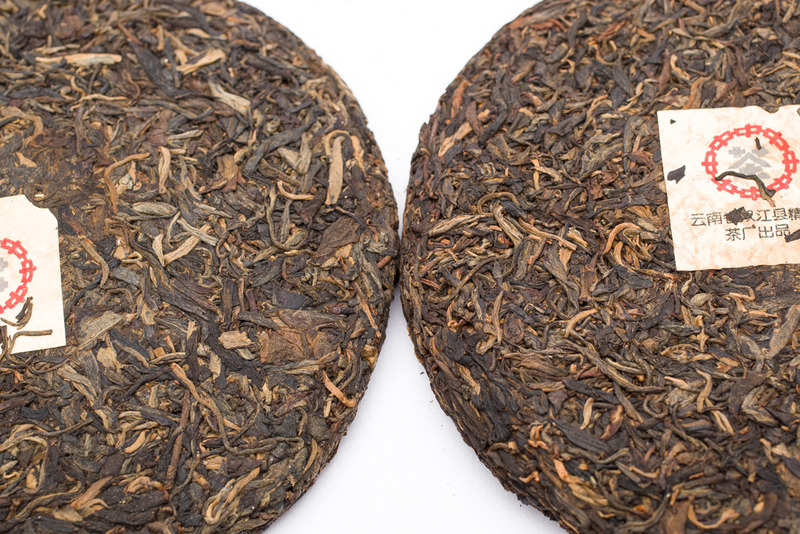 There was no hint of rawness in the smell – none of that sweet aroma of aging tea, or the youthful greenness that you get with a younger tea (as befits a Kunming stored puerh). Instead, just a faint whiff of cooked puerh. I chalked it up to potentially the couple bags of cooked puerh samples the seller threw in with the cake. There are some oddities on the cake itself – hard to see with any kind of picture but apparent if you examine it in detail. There are some leaves that look funny, with little white dots that are uncharacteristic of dry Kunming storage. But, that alone isn’t going to be enough to warn anyone. 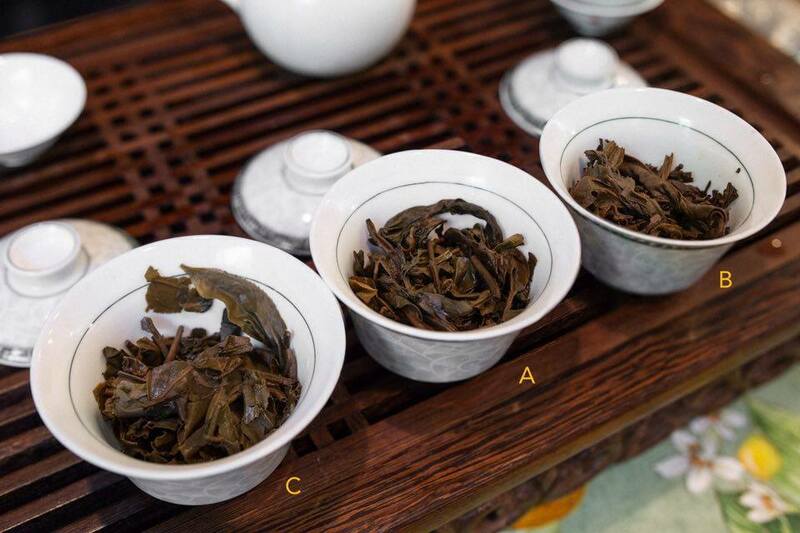 You can see that there’s a mix here – the cooked tea is the dark stuff, and this is the variety that is very cooked – they’re carbonized, hard leaves that don’t really bend, not the soft stuff you might see from Menghai. In other words, this is cheap stuff. The raw tea is probably worse – I suspect it is brewed tea leaves that are then dried again, because if they were using new leaves there’s no way that the tea doesn’t impart any taste, but as it is there’s almost no raw, new tea taste to it despite the tea consisting of mostly raw leaves. I only took a couple small sips before dumping the whole lot. What’s the lesson here? Well, anything is possible, even stuff you thought impossible. Judge a tea on its own merits and not on what the vendor is telling you, and sometimes the truth is pretty disgusting. And Jack Ma is wrong at least when it comes to tea – the vast majority of the fakes are horrible things that should never be drunk. In response to my post about the YYX, one reader suggested that Phyll and I should do a Google hangout session. Google hangout is useful, but it’s not ideal for tea session – the most important issue is that you are not drinking the same cup. Even if you measure everything down to the exact decimal and brew using the exam same parameters and the same teaware, at the end of the day you’re not drinking from the same leaves and so will not share exactly what you have. Drinking in person is always better. So obviously, the solution is for me to fly to LA and join Phyll and Will to have a tea session together instead. Will’s joining is fortuitous – not just because he’s another old tea friend from the area, but because he also possesses a few cakes of YYX – in his case he bought it from the Best Tea House directly in 2010, and then stored in his home in LA ever since. So in some ways his tea offers yet another example of differing storage of YYX. His storage condition can be called natural – while it was briefly stored in a pumidor, for most of its life the tea has just sat in a (mostly) closed cabinet in his home in Los Angeles with no additional moisture. I’d presume it’s air conditioned in the summer months. We started our session with the comparison tasting – it would be bad otherwise if we leave it to the middle or the end of the session, when we might already be tea-fatigued. Instead of drinking it, say, competition style, we decided to drink them serially. Will’s was the first. One of the most obvious things to note about his sample is that it has some smoke – the smoke is fairly obvious and is noticeable even before brewing. The tea’s astringency and bitterness come through. Once you swallow it turns to a nice huigan that has some legs. 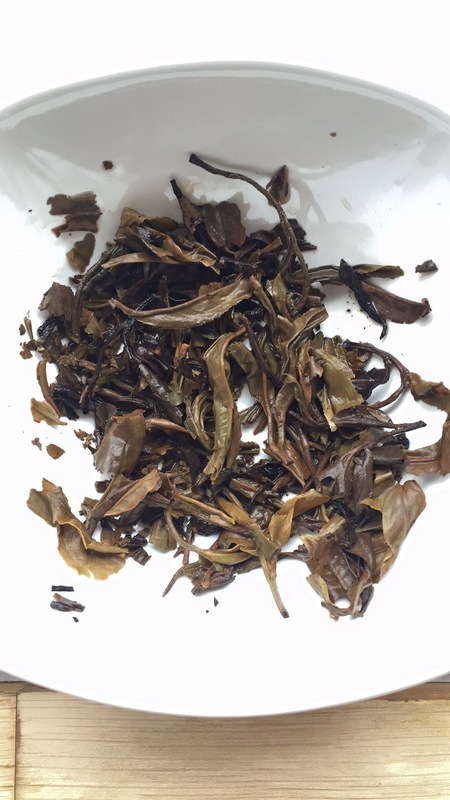 We didn’t use a lot of leaves – 4g for a small gaiwan. We drank about 7-8 infusions before it becomes more or less flavoured sweet water, at which point we moved on. The wet leaves for Will’s sample are still greenish in tone (C in the photo). Second up was Phyll’s (A). There is one problem with Phyll’s tea, stored in his offsite wine cellar. The wine cellar uses wood drawers for the storage unit, and over the years it seems like the tea has picked up a fair amount of the wood smell. It was apparent to me when I unpacked the cake that was sent to me by Phyll, and I notified him as much. Leaving it around my house for two months before tasting it didn’t really diminish the wood smell, so it will probably take longer for it to happen. The wood smell and taste dominates the first few infusions, overpowering almost everything else. The tea is smoother than Will’s, with less astringency and less obvious bitterness, although that may have something to do with it being the second tea we’re drinking (the bitterness, anyway). There’s no aroma that is discernible because of the strong wood smell. The leaves are noticeably darker with a slightly more leathery texture. 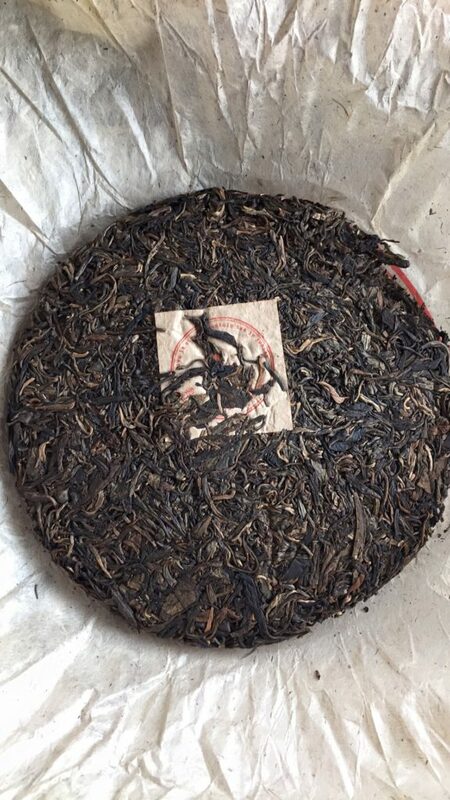 After about 4-5 infusions the wood smell/taste recedes and some of YYX’s base notes show up, similar to Will’s tea. In that they are not too different. The wet leaves are dark. My cake came third in our tasting (B in photo). The first thing that Will noticed, as he was the one prying the tea from the cake, was that it was looser – the cakes have loosened over the years and it’s easier to pry open. I noticed the same when I tried the tea at home. The tea has lost any sense of astringency and is also not very bitter anymore. There is some fruity/plummy taste, and sweet in the back. There’s also a touch of sourness. The body seems slightly thinner, and as Phyll notes it’s lost the vibrancy of youth in comparison with the less-aged samples. Once you drink enough infusions, the tea reverts to similar base notes that you find in the other YYX we tried already, with maybe a touch more age to it than the others. The wet leaves are about the same colour as Phyll’s, surprisingly. So, what’s there to learn here? 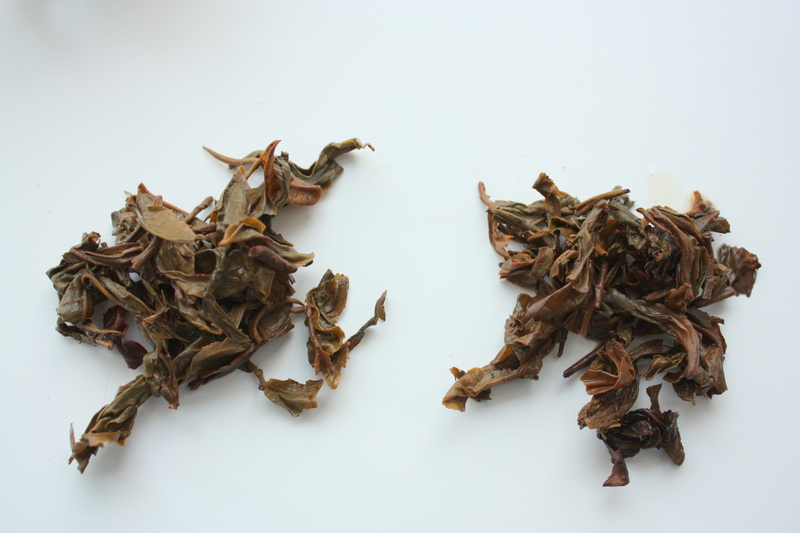 Well, first, that there is a real difference among the teas. However, the differences are not huge – they are easily discernable to anyone who’s paying attention, but you can also tell, after some drinking, that they have the same base. Mine is the furthest along in the aging path – there’s no doubt about that. 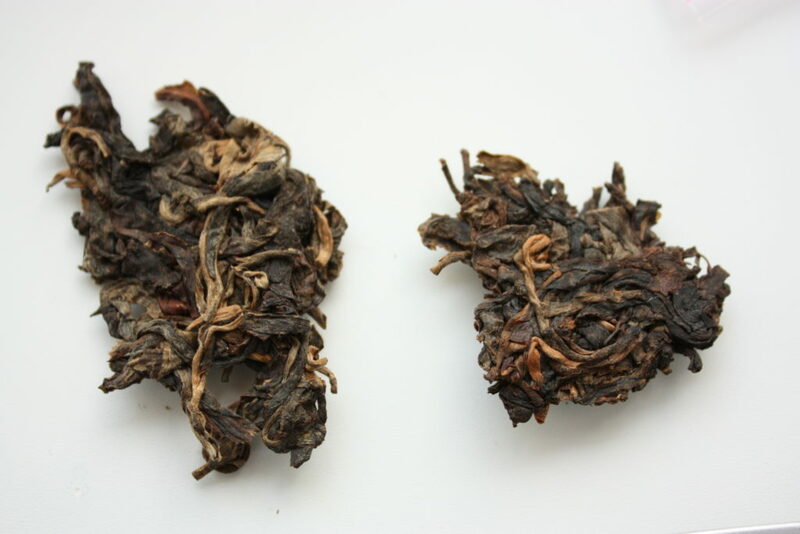 It has developed some of the notes that you start to get when a puerh has been aged long enough – plum, fruit, etc, and lost that more floral and astringent character of younger teas. Environment certainly matters – if you don’t believe that the smell of the storage environment can change how a tea tastes, a smell of Phyll’s cake will convince you otherwise. He’s already moved the cake out of the storage, but it will probably be some time yet before it can actually get rid of that smell, and chances are there will always be a trace of it remaining given how long it’s been in contact with that smell. I do wonder how much aging has happened to Will’s cake – is it more or less in the same condition as when he bought it in 2010? The existence of smoke, the green wet leaves, and the astringency suggest that not a lot of aging has happened since. It’s great if you love your tea young, but I also suspect that it’s not so good if you like your teas aged and mellow. The tea doesn’t taste like a 15 year old tea. Phyll’s cake, despite the extra wood smell, is smoother than Will’s. The 10 years it spent in the offsite storage with relatively higher humidity has done something to the tea. The low temperature probably prevented it from being more aged-tasting. It’s an interesting mid-point between Will’s tea and mine, and altogether somewhat different. It will be interesting to try Phyll’s cake again after say a year or two, let the wood air out, and see if it changes/improves. It will also be interesting, now that I possess a cake, to see how the one stored in Hong Kong will diverge from the ones stored in LA. Maybe we can report back on this experiment after another year or two and see what happens then. As for the rest of the tea session, we drank a mid 90s 7532 that tastes somewhat cooked due to storage conditions, the 2005 Yisheng that tastes classically Yiwu, 2006 Yangqing Hao Chawangshu, which is similar to the Yisheng except even smoother, but for me lacking a punch. We finished off with a very high end dancong that I procured a while ago that has exceptional qi. The teas were all decent, but it’s the companionship that is the best. It’s good to see old friends again, and now we all have old(ish) tea to share. I look forward to our next tea session! People who read this blog probably have all spent at least some time worrying about storage conditions for their puerh tea. There are lots of people who have written lots of things on this subject. Some are plain wrong. Others more plausible. At the end of the day though, there isn’t much hard data to go by, so it all ends up being a bit of a “he said, she said” sort of thing out there. So it is a bit of a good fortune that I am now in possession of two cakes from the same batch that have been stored separately for over 10 years to compare. The cake in question is the Mengku Yuanyexiang (YYX). 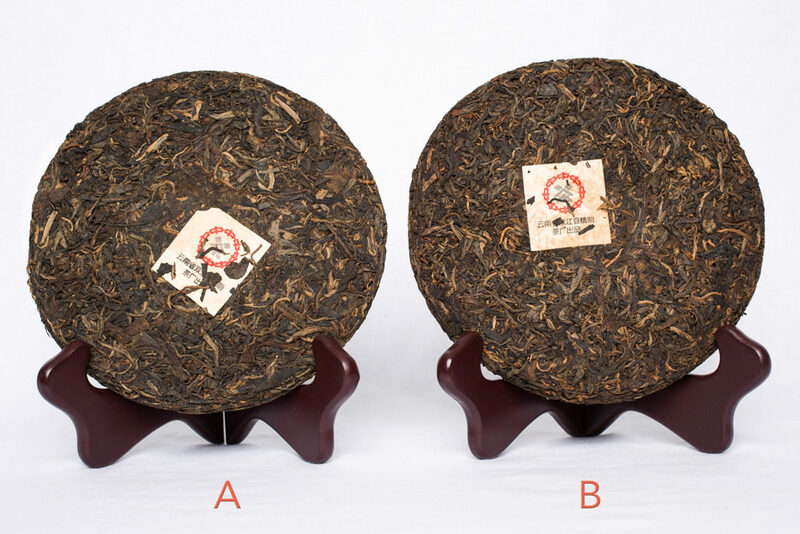 It gained fame originally because some people hyped it up around 2005/6 through the puerh magazines and online forums. 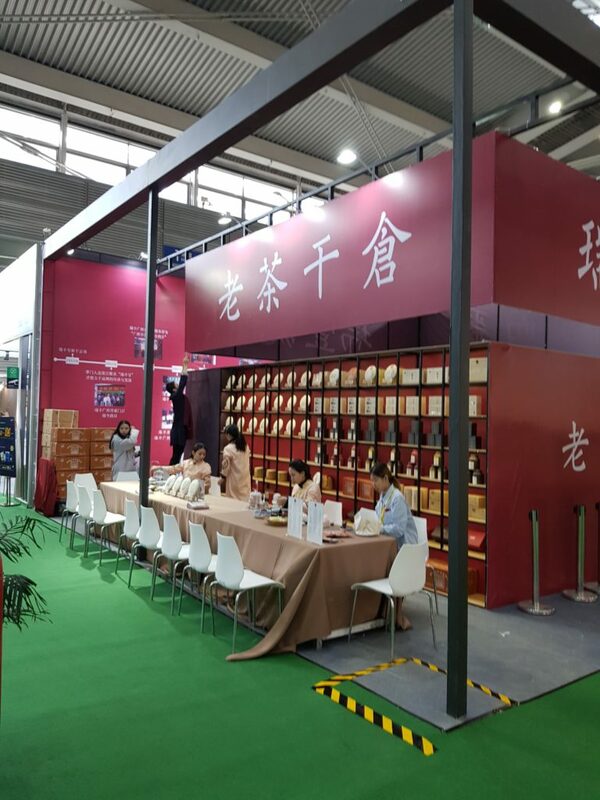 The tea was produced by the Shuangjiang Mengku Rongshi factory, and exists in a thin and a thick paper version, with the thin paper version being naturally stored while the thick paper is traditionally stored. There was only one batch of each ever made, and while prices shot up when it became famous, the tea never really took off after that and is currently still on sale at places like Taobao for about $250 USD, although there seems to be only a few cakes left. Honestly, at that price it’s not really worth it, especially if the seller is an unknown quantity. The cakes here in question come from two sources. One is mine – I bought mine from Taobao many years ago for something like $30 USD. The other cake is from a good old friend Phyll, who is an active photographer based in LA and who used to, many years ago, run the tea blog Phyll’s blog. He even has a tasting note for the YYX here. He bought it from Guang of Houde when they used to sell this tea. We have each acquired our cakes about 9-10 years ago, and have stored them since. My storage is quite simple – it has always lived in Hong Kong since about 2007, in a normal environment, no extra humidity, no climate control, nothing more than just “leave it out there and let it age”. It’s mostly lived in closed shelves/boxes, but not air-tight ones. Phyll, on the other hand, has mostly stored his tea in his off-site wine storage unit with a permanent 15 degrees celcius temperature and a constant 75% RH. So while he lives in LA, this is not LA storage but really a controlled climate storage. So about a month or so ago we decided to swap teas – we traded cakes, basically, since we each have more than one. I take my photos, usually, but since he’s a professional with much better equipment, this is what the teas look like. A is his, B is mine. There are a few things to notice here – mine is shinier, and it’s not an optical illusion or lighting problem. It really is. The brown is slightly darker/browner on mine as well, while his has a slightly greener undertone to the leaves. The paper on mine is more torn up, but that’s really just because the paper is extremely thin and tears up with any movement – and I’ve moved the tea a couple times. Aside from that, there’s no obvious difference. They smell a bit different, but that’s to be expected. I actually have not tasted the teas yet. I have been holding on to the tea, trying to get it acclimated to Hong Kong before drinking. Sometimes air travel and what not can change things in the taste of a cake. I also just haven’t had the opportunity to really sit down and drink teas side by side. I hope to do so in the near future, so stay tuned. First of all, it’s useful to get a sense from looking and smelling the cake to see how heavy the storage was – how wet, for how long, basically. There are some hints. You can smell it. You can observe the amount of mold on the surface, although that’s not a good indicator because some people actually use brushes to brush off most of the spores. You can also open the cake up a bit to see what it looks like inside – if it’s really white inside or not. Really heavily stored cakes also often have some warping – they get so wet that they warp under pressure of all the other cakes on top and sometimes around them. This doesn’t look too bad. The reader actually had two questions – will this cake contaminate the other cakes he owns, and how to deal with this – to make it get better, I suppose? The first thing to note is that since mold can grow on anything, just putting your moldy cake in the same storage space as your other cakes is not automatically going to cause mold on other cakes, unless your storage environment allows it to happen (wet, basically). At 30% RH, that’s not going to happen to this reader’s storage situation. It could, however, impart a bit of a smell to the other cakes in the same container, so my advice was to put it separately, perhaps in something like an unsealed cardboard box, and just forget about it. This comes to the second point – often times the biggest problem with these traditionally stored teas, especially if they haven’t been out of their wet storage phase for too long, is that all you can taste is the musty, damp forest floor smell. The rich flavours that you can get from traditionally stored teas aren’t apparent yet, especially the sweeter flavours. To get rid of the sometimes pungent smell, the best way to deal with it is to just let it air out a bit. This is the one time when you do want a bit of airflow or at least air exchange. It takes time, but eventually the really obvious musty smell will go away and you will have something that’s more drinkable. These are probably drinkable now, but it should get better with age. I also have friends who would brush off the spores themselves, although for your sanity and health I’d do that outdoors. Get a new toothbrush and just lightly brush them off. It really won’t change much of anything but it might look better, and to some people that’s actually an important psychological step in dealing with the tea, it seems. When drinking traditionally stored teas, it’s often not a bad idea to throw away the first two steeps. A good old friend of mine who grew up drinking these often said the real taste doesn’t start to show up until about steep five. There’s a certain truth to that – everything before is really the storage talking. Definitely rinse the tea, probably twice, before trying it. If it’s still super pungent, you might want to let it sit some more, or throw away another infusion. Part of the fun is learning how they transform, and traditionally stored teas change in ways that are more obvious than naturally stored teas. 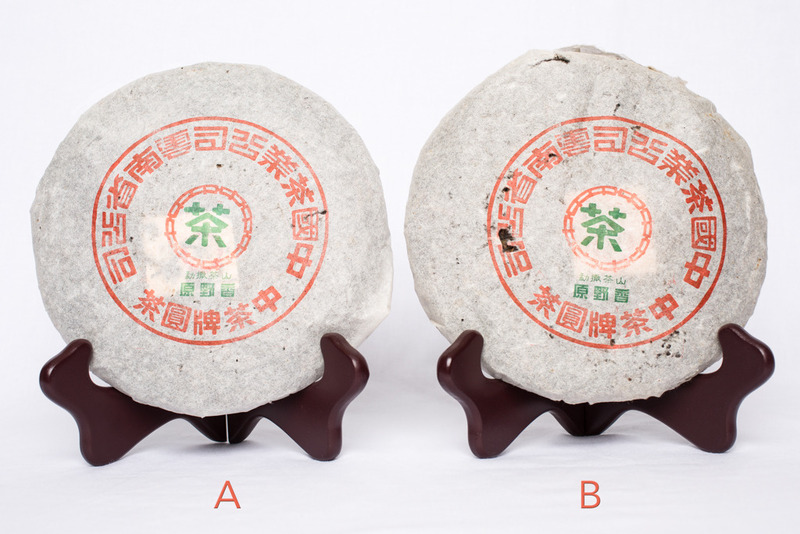 Finally, I should add that one of the most interesting things you can do is to try to find traditionally stored cooked puerh – they are actually quite different, and richer, than naturally stored ones, which tend to be rather boring. The traditional storage process also tend to get rid of the nasty, pondy taste. They also come cheaper. I’m not sure if any vendor out there is selling something like this, but if not, they should look for it because I think there’s a market for this stuff. At what point do you give up on a cake that you have kept for aging? I ask this because it is an important question for those of us sitting on tea. 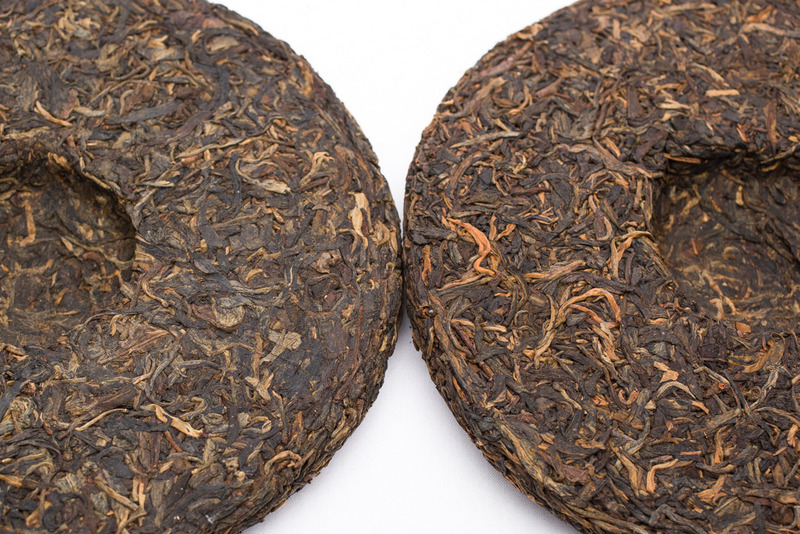 If you are a buyer of puerh and have stored some for aging, at some point you need to take them out and start drinking – after all, that’s the point. When you first start, it is likely that you bought more or less indiscriminately. You may have purchased teas based on recommendations by others who are supposed to, perhaps, know more than you. You may have bought because of the reputation of the vendor. You may have also bought because you liked how the tea tasted then. Afterwards, a few years later, perhaps, you take out that same cake again and discover that it’s changed, but not necessarily for the better. What do you do? You tell yourself “well, it’s just going through that awkward phase; it’ll get better” and put it back in storage. What if the same thing happens two years later? Four? Ten? When do you just tell yourself “this was a terrible purchase and it’s never going to get better”? I have a bunch of stuff like this. Some I bought because they were cheap at the time and I figured I could afford to gamble. Some because, well, I didn’t know better. Some because they seemed decent at the time, but subsequently has turned out to be quite terrible. I know my aging environment is fine, because I have a number of teas that I stored myself for ten years now that are quite drinkable. So the aging environment isn’t the problem; the tea is. It’s true that sometimes teas do go through an awkward phase. They have lost that initial sweetness/floral fragrance that are characteristic of new teas, but have not yet developed old tea taste. It’s that weird in between state where it’s really a pretty bad thing to drink. However, I also think that there are many teas out there that simply cannot and will not age. This is mostly because of bad processing to start off with. If your tea was processed like a green tea, bad news, it’s not going to get better. Aged green tea will never develop that complex and rich flavour of puerh that you should be striving for (and if you are one of those people storing tea to preserve its flavours and fragrance, you’re in the wrong business). A telltale sign of a tea that is processed like a green tea is a beany taste – think a fresh biluochun, a classic beany tea. If your tea smells like a longjing or a biluochun, it’s time to drink it fast because it’s not going to get better. There are, I think, storage environments where the tea will also die, and I suspect (although without firm proof, because I haven’t tried) that once killed by bad storage, the tea will never recover. There are of course two types of death by storage. 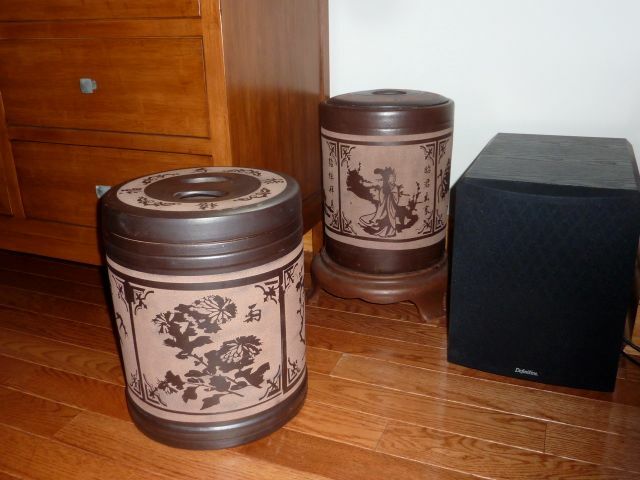 The first is the obvious – heavy mold, bad mold (golden flowers), extensive sun exposure, etc. The second is more subtle – environment that has strong odd smells (medicine cabinet, for example), too close to the sea (it will get salty), too dry (the tea will taste thin), etc. Some of these in the second category need not be fatal, if recovered sufficiently quickly – a week in a medicine cabinet won’t do anything bad to your tea. Three years, however, and you have a different problem. So if your tea is aging poorly either because it was bad to start off with, or because it has had bad storage, at some point you should just give up on it. Even though it may taste great initially, it’s no guarantee that it will age well – many well known teas were terrible when they were young, being very bitter, astringent, smoky, etc. When you want to give up is of course up to you, but I think by year five, if the tea is getting thin, more and more bitter, or otherwise exhibiting signs that it is not aging well at all, it may be time to reconsider the value of keeping it long term. As a comparison, it is useful to keep a cake of Menghai 7542 around as a control. 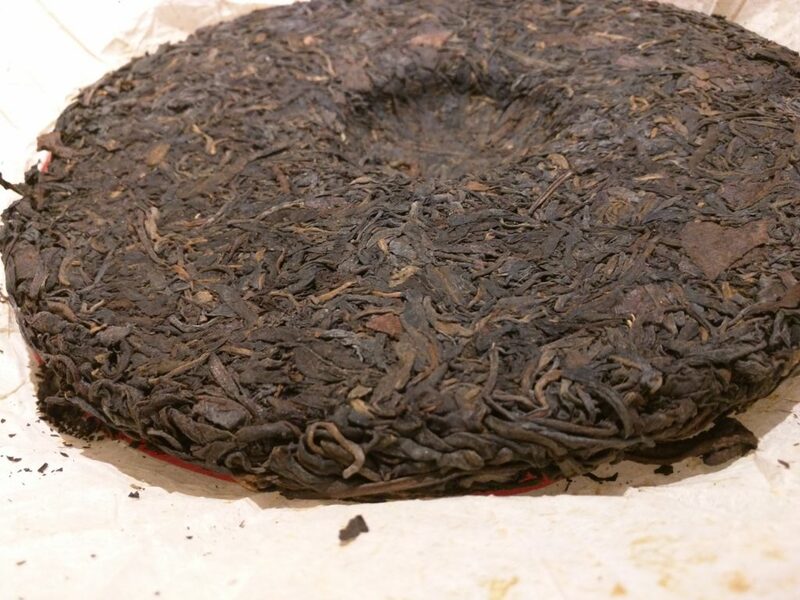 It is, after all, the standard puerh cake. If your 7542 is aging badly, then it’s your environment. If your 7542 is aging well and your other cake isn’t, well, it’s the cake. Hope is, of course, what keeps us alive and living, so hoping that your tea will recover is a natural thing. Sometimes though, it is useful to admit defeat, drink up the tea (or get rid of it) and save some space. You’ll thank yourself next time you move. Some years ago, I gave my cousin living in Portland, Oregon this cake. I bought about a dozen of these when I was in Beijing, and I sent them one. I think it was 2007 when this happened, although it could also be in 2006. Either way, it’s been some years, and every time I visit them I would try a little bit of it. It’s gone through natural storage in their kitchen pantry in a ziploc bag. When I open it it usually smells of nothing. The rest of my cakes, ever since I left Beijing, have been stored in Hong Kong, also in natural home storage. They were mostly in tongs, although I had a few loose cakes. I didn’t put them in any ziploc bags, so they were just sitting out there. I didn’t really drink that much of it over the years, so I still have about 10 of these. It’s actually rather scary how they’re all soon to be 13 years old teas now. Recently I grandpa’ed a cake of the ones I stored in Hong Kong, so I got to know the taste of my tea really well. When I visited Portland over Christmas, I tried a little of it as usual, and I noticed that it’s obviously different from what I have at home. So I asked them for a little sample of the cake, and took it home. It’s impossible to tell if the teas tasted different because of the water or if it’s because the tea itself is different. My impression in Portland is that it is a little more fragrant, but also a bit thinner and sharper than what I have at home. So I brought it home, and decided to brew them side by side. The left one is the Portland one, the right one is the Hong Kong one. You can see that the Portland one is a bit lighter in colour. So I took 3g of each (this is 3g you’re seeing, minus a little extra) and then brewed them. I brewed them for two infusions of five minutes each. The colour of the brew is not very obviously different in the first infusion, but somehow for the second it actually became more obvious. So the right one is a bit darker, surprise surprise. The tastes of the teas are, as I expected, a little sharper, a little more floral, more “high” notes but less “bass” for the Portland stored one. The Hong Kong one is a little bit darker in tone, a little smoother in the body, and a little bit sweeter. Are the differences obvious? Yes. Are they still recognizable as the same tea? Also yes. Not a lot of information from either the dry leaves, the liquor colour, or the wet leaves visually. The effect of storing in Hong Kong, versus storing in Portland, is a bit like using different casks for scotch. Portland, in this case, would be the oak cask from start to finish, whereas Hong Kong is a little more like a sherry finished one. I think the Portland tea has definitely transformed less – it’s closer to the original, with a bit more bitterness retained and a little less change over time. The Hong Kong one is still bitter as well, but a little less so. I suppose preference for one or the other is really a personal choice, but to me the biggest knock against the Portland tea is that it feels sharp and thin. It’s not as pleasant when compared against the Hong Kong stored one. The differences are solely due to storage – they were bought together and until I gave it to my cousin, the teas were stored together. This was a pretty interesting natural experiment. One of the consequences of having a child who is physically mobile is that having tea the usual way, which means with a piping hot stove, with various breakable teaware, is becoming a bit less practical. I could close the door and drink to my heart’s content, but I prefer not to do that. What it means is many more teas that are drunk grandpa style than ever before. Doing so has affected the choice of tea I drink. One of the things I reach for most frequently now is actually the cheap tuo that I bought a lot of – one reason, of course, is that I have kilos of this tea, but it’s also because it does very well in a grandpa setting. Tea, as we know, is sensitive to preparation methods. When the tuo is drunk with a gongfu setup, it is mediocre – not very interesting, a bit boring, a bit bland. It doesn’t quite have the punch of better teas, and while it has 10 years of age, it’s not particularly exciting. In a grandpa setup, however, it actually brings out some nuances that are easy to miss in a gongfu setting. I would in fact say that the tea has improved doing so – I am rather happy drinking it day in, day out. It’s a joy. 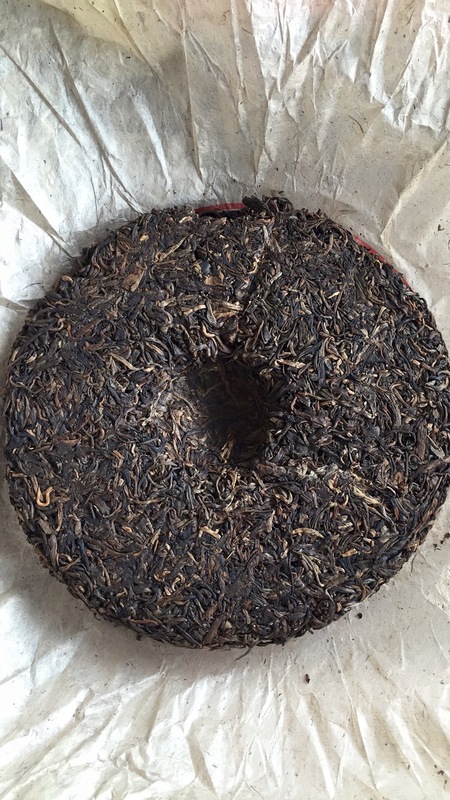 Another tea I’ve been reaching for a lot is a 2002 Mengku cake that I bought years ago in Beijing, back when this blog was first starting. I have two tongs of this tea, and can get more at reasonable prices simply because there isn’t a huge demand for this tea. It’s not the best either – but certainly quite decent. One type of tea that I do not grandpa, almost as a rule now, is newly made puerh. They are, by and large, terrible in that context. That is partly because most of the teas that I would subject to grandpa drinking tend to be on the cheaper side, and cheaper newly made tea is usually just horrible things. It’s also because without any aging, the rough edges are still, well, rough. You end up with really astringent, bitter, and unpalatable teas. If you add just a bit, then it’s nice and soft, but not as nice and soft as a fine green tea, which I would infinitely prefer to a new puerh as a grandpa option. In other words, they are never picked first. This may also go some ways to explain why puerh has always been considered an inferior tea – when new they are simply not very good. When aged they are fine, but with prices now astronomical, they are no longer practical drinks for most people. 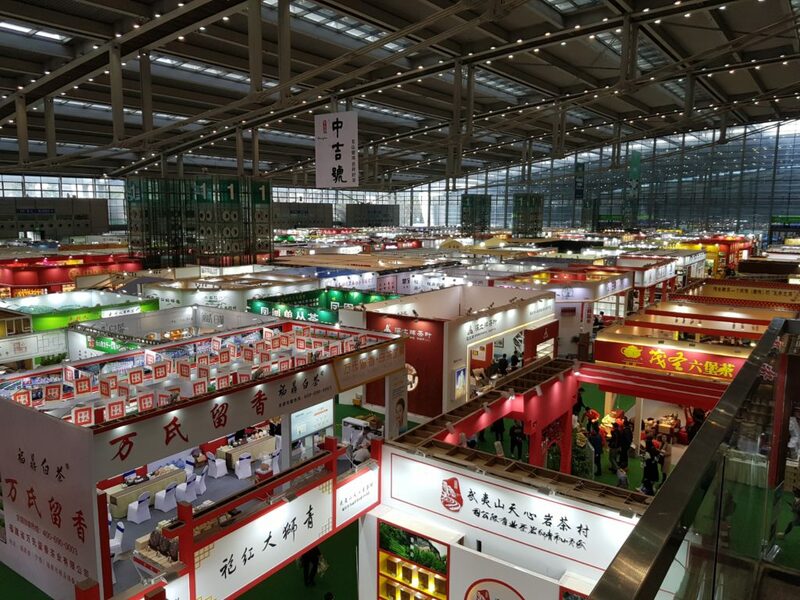 Already, aged and new puerh tea of decent quality are being priced out of the market for regular tea drinkers. That is really a tragedy. This is a tea display from a grocery shop not too far from my home. 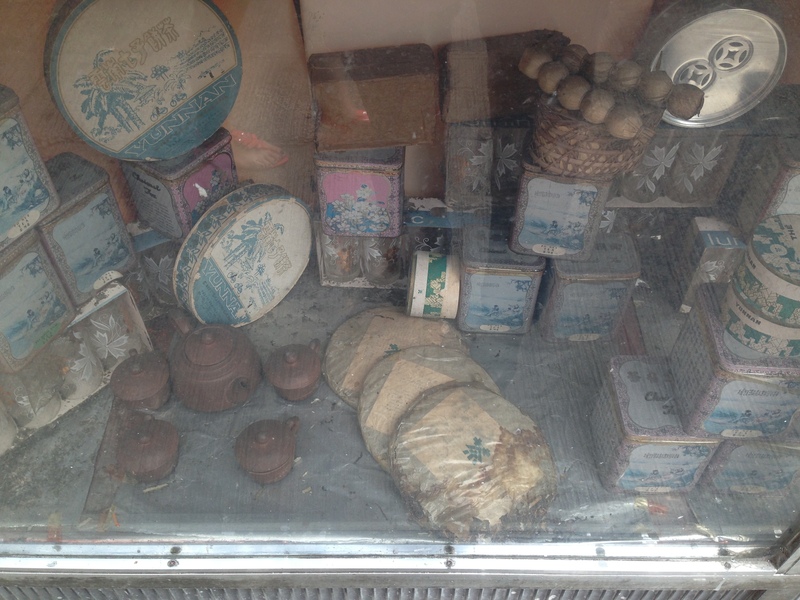 They sell some pretty dubious teas, not sourced from this little display, of course. Nevertheless, if you ever need convincing that storage environment matters, this is it – it’s exposed to the sun, probably really hot, and hasn’t been cleaned in decades. God forbid you end up with a cake from here. A few months ago a reader of the blog emailed me with a problem. She is newish to puerh, and has been buying some cakes since 2011. She bought some clay jars to store the teas in, and in the hopes of speeding up the aging process, decided to try to add a bit of humidity to the jars to make things go faster/age better. This much sounds familiar – lots of people do similar things, especially if they live in drier climates, because, well, they worry about the tea not aging properly. These are the jars. Then the inevitable happened – first, signs of yellow mold, which can be dusted off easily and stopped the addition of humidity to the tea (by some method of adding water to the clay and let the clay soak it up, I believe). Then, a more invasive problem appeared – bugs, little bugs, that were all over the cakes, especially one, but it was showing up on others too. She threw out the most heavily infested one, but now almost all the cakes have bugs in them, and they move fast and run away from light, what to do? In desperation, she emailed me to ask – what’s a good way to handle them? She threw one of the cakes with bugs away, but there were more. Another she put in a freezer, hoping that it will kill the bugs. Was microwave a possible way of killing them? Something else? I think a little perspective is useful sometimes, because I’ve met others who have had similar reactions before. Puerh, when you buy them new, are, well, an investment of sorts. If your plan is to store them and drink them in the future, chances are your time horizon is years, if not decades. If that’s the case, even momentary infestations of all kinds of nasties will go away. Some, like mold, may leave a permanent mark on how your tea tastes. 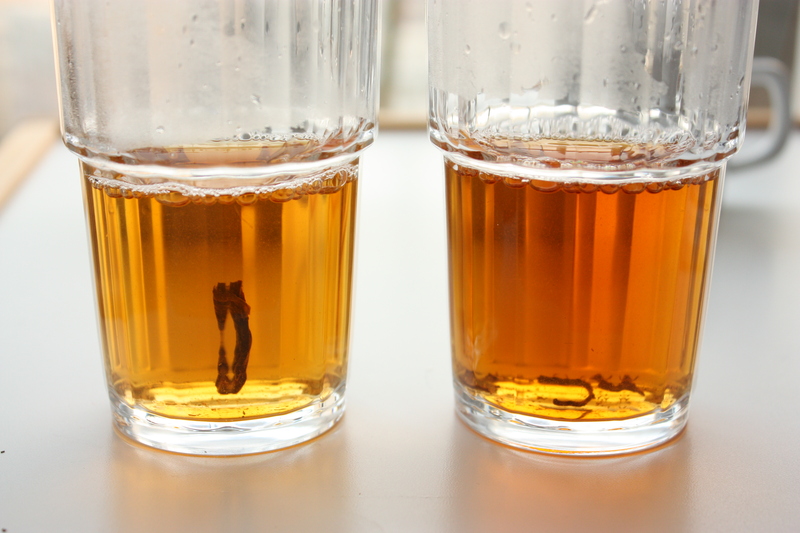 Others, like little bugs, will barely make a dent in your tea, if you manage to get rid of them. So, when you run into problems like this, the first thing to do is not to panic, unless you spent your life savings on the tea and your life depended on it. If it’s just a hobby – there are ways to fix the problem. What not to do is to overreact and put the tea in, say, the microwave and permanently destroy it. That will really end the tea’s aging potential and cause irreparable harm. Since in this case it was obviously the wet jars and the attendant humidity that was causing the problem, I suggested the reader to take all the cakes out of the jars, and then separate the cakes into two piles – ones with bugs and ones without. The ones without, just store them on a shelf or something. The ones with the bugs I suggested perhaps putting them somewhere, spread out, and just let them air out. Usually, bugs like these that live on puerh cakes tend to love the humidity, and are mostly after the paper. Once it gets too dry they will go away, especially if it’s not a dark humid space. I had bugs like this on some bricks I bought some years ago, and after a few months all the bugs were gone, and I didn’t even do anything special to get rid of them. So, happily, the reader wrote back to me a few weeks ago saying that the bugs were, indeed, all gone. 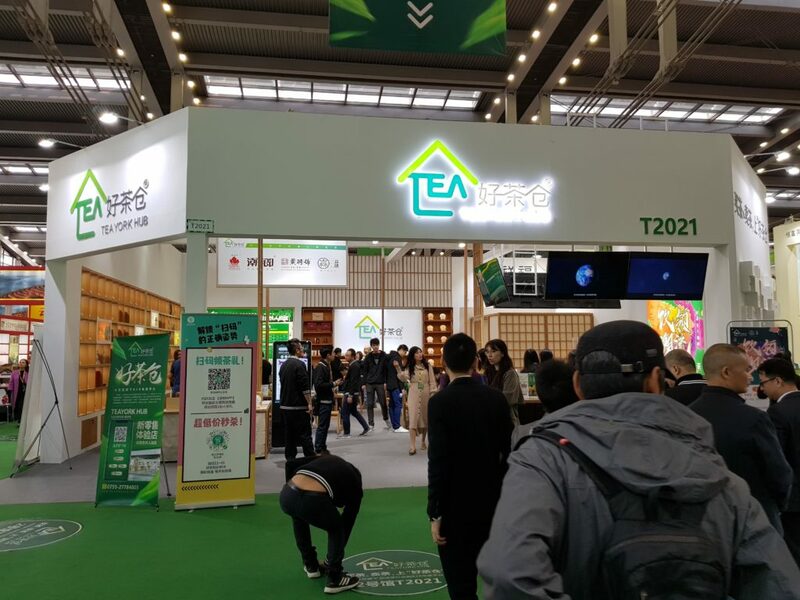 No more problems, and the tea is probably a bit dry, but certainly better off than in some uncontrolled humid environment with a high risk of mold and bugs. They’re going back into the jar, but without any added humidity this time. I think the aging will be slow, but there’s only so much you can do with natural climate. This is not the first time I’ve encountered folks with storage problems that were man-made. Usually the root of the problem is the desire to somehow replicate a more humid, hotter environment so the tea will age faster, but that is not so easy, and the risks of failure also increases dramatically when you pursue such projects. I am an advocate of simple solutions, such as, say, adding a bowl of water to a storage cabinet, but anything more and I’d be weary. If you do pursue such projects, monitor the changes very closely. Mold can grow on all kinds of places, but on tea cakes, they generally start at the end of the stems, so watch those carefully. They can also be in some corner of your storage unit in that long forgotten tuo sitting in the back – and that can fester and kill your whole stash. You can never really replicate the storage conditions of a giant warehouse with hundreds of jians of tea. Just today I was walking by Lam Kie Yuen and saw them loading up a truck for delivery. 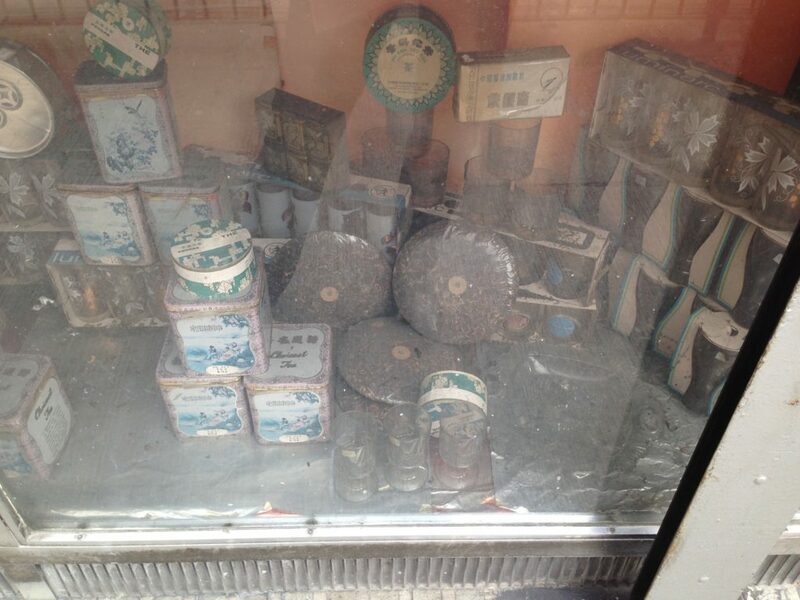 There were probably 200 jian of puerh in that truck, meaning there were close to 17000 cakes in there. Storage that amount of tea and storing 20 at home are not the same thing, and they have decades of storage management experience to back them up. So, proceed carefully, and if anything goes wrong, don’t panic. Airing out the tea for six months will solve most of the problems.